With restrictions lifted in all three zones of the Chain O’ Lakes and Fox River Systems, the Fox Waterway Agency is quietly going about the business for preparing for the 2019 boating season. Floating debris, opening channels, and the one-week delay in boat sticker sales were addressed at the March 27 board meeting. A primary effort for the start of April concerns itself with the dropping of buoys for navigation in heavily-used traffic lanes. 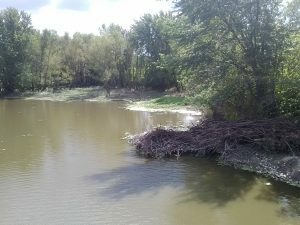 The March 15 closure of the entire system, from the Wisconsin state line to the Algonquin Dam, was imposed by the Illinois Department of Natural Resources, which oversees and monitors the water levels. By March 21, the Fox River at the Algonquin Tailwater, the stretch of water immediately downstream of the dam, sat at the 9.1-foot mark and its flood stage is 9.5 feet. The Fox River at the McHenry (Stratton) Dam was at 3.8 feet, where its flood stage level is four feet. “The lower river takes a little longer for the levels to go down, just from the flow of the water,” said Joe Keller, the agency’s executive director. “The New Munster, Wis. gage showed waters were getting back to normal, and the cresting is done. The ‘no boating’ restriction was lifted March 27, moving to a ‘no wake’ notification and that item was presented at the meeting. The upper river was at full boating level, by then, after waters receded and allowed land to dry out. Although the weather service issued a flood warning for McHenry, the gates at both dams were opened as much as possible without severely raising the water levels between the two stationary points. IDNR dictates the actions of the dams, and has made strides in attempting to adapt to and match the changing weather patterns. “You can tell they’ve taken a more proactive approach with these erratic weather patterns,” said Keller. “Now, lakes are free of ice and we can get out there and start attacking some of these concerns of debris. We talked with officials, from the Village of Fox Lake, they’ve noticed the debris too. It’s places like Squaw Creek, and the smaller ancillary channels, mouth of a channel and the main thoroughfares … it’s all over the system. “Buoys are being put out, and we’re focusing our attention on these areas as primary concerns for the next few weeks,” he said. The annual boat stickers for using the Chain O’ Lakes-Fox River systems got underway one week later than usual, due to the cold weather. The stickers provide a major source of revenue for the agency to cover its operating expenses throughout the course of the year. The renewal applications were sent out one week late. As of the end of February, the agency has collected approximately $400,000 in sticker fees compared to $440,000 in fees at the same point in 2018. The system divisions are: Zone A is Algonquin Dam to McHenry (Stratton) Dam; Zone B is from the McHenry (Stratton) Dam to Pistakee Lake; and Zone C is from Pistakee Lake to the Wisconsin state line.